A 55-year-old worker died while securing a load of round hay bales. The worker was in the process of delivering round hay bales on a flatbed truck. After driving about five km from the farm, the driver noticed that the load of hay bales had shifted. He stopped on the side of the road and called for assistance. A farm tractor equipped with a poke arrived to help secure the load. The driver and tractor operator removed the bales from the flatbed truck and rearranged them to stabilize the load. They finished reorganizing the first tier and started placing bales on the second tier when the driver was struck by a bale. It appears the driver was attempting to strap the hay bale when it tumbled on him. 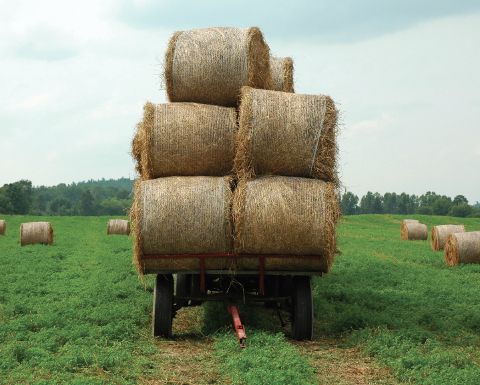 Avoid areas near and around a trailer with unsecured bales unless you are actively engaged in fastening or unfastening devices used to secure the bales. Assess the risk before approaching any unsecured load. Ensure stacks are safe at all times. Any vehicle transporting hay bales should have a lift on the outer edge of each side that has a minimum height of 3.5 inches and slants the round bales towards the centre of the bed of the vehicle. All bales on the top tier must be tied down. For more information about lockout, see sections 239 to 240 of General Regulation 91-191, under the Occupational Health and Safety Act of New Brunswick.